If you are an incident safety officer, you understand how important it is to be prepared at any time for whatever disaster may occur. You’ve completed numerous drills with your team as well as continually monitor the workplace and other areas for potential hazardous conditions. An integral part of this preparation is having the right safety vests to ensure you and your team can easily be seen in an emergency situation. A perfect solution for any officer is the Incident Command System (ICS) vests from SOS Products. The ICS vests have a number of unique features that make them a great option for disaster situations. First, the vest comes in a variety of colors allowing you to organize your team by color based on their required job. For instance, red vests could be for those who are assigned to give medical attention and blue vests for those responsible for employee check-in at safe areas. Additionally, the vests are one-size fits all and come with high intensity 1” reflexite yellow stripes, which allow staff to clearly be seen by those in need. 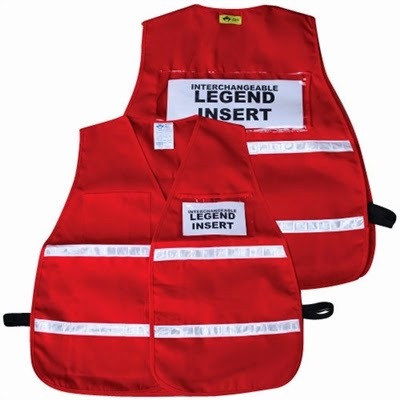 Lastly, the vest has clear plastic pockets on the front and back of the vest where you can place identifiable job title inserts or company logos. The ICS plays an important role during emergency response situations as ICS officials are often first to the scene of a disaster. You don’t want to have to worry about any equipment including your safety vests during this time. These ICS vests are durable and specially designed with your team in mind. They’ll help you get your job done no matter what the emergency is.